My pwc measured ~2” of rain on Monday evening 6/25/18. 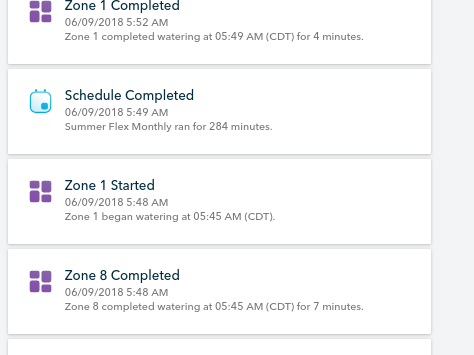 Rachio had a water scheduled for Wednesday early AM on 7/27/18. I figured it would saturation skip based on the amount of rain we received just a day ago. Can you please advise on why this skip didn’t happen? Great question. Saturation skip goes back a maximum of 7 days from your last scheduled schedule watering. We need to start with a baseline (when was the last time the zones were irrigated) so we can track evapotranspiration from that point until your next scheduled watering and determine if the zone will have enough moisture to make it until the next watering. In your case the last full schedule run was 6/9 so unfortunately outside of our boundary for skip checking. I’ll talk with the engineering team to see if there is anything we can do to optimize if the last scheduled watering is outside our boundary. Maybe if we don’t find a scheduled watering in the past take the first precipitation event and start there. I talked with @theflexdude and we are going to set the baseline to “zero” 7 days in the past if we don’t find any previous irrigation. This will help the issue that you experienced. Thank you for reporting!